A fast growing, drought tolerant, climbing cactus that provides magnificent large fragrant flowers and exotically beautiful fruit with a delicious taste somewhat like a melon. 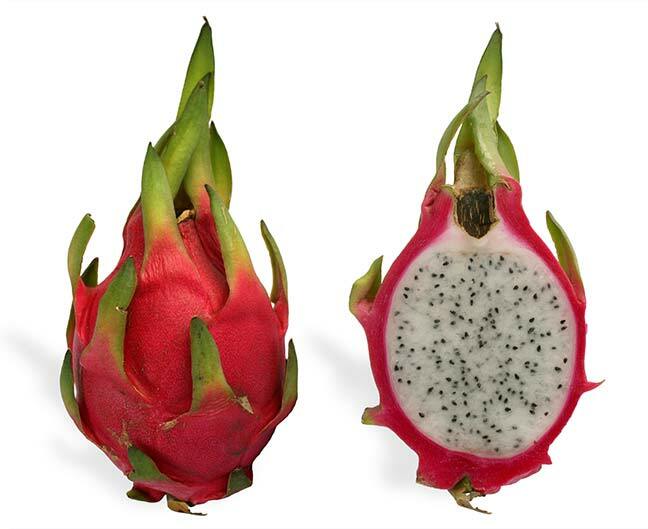 Also known as Pitahaya, Night blooming Cereus, Strawberry Pear, Belle of the Night, Cinderella Plant, Jesus in the Cradle. This is sent as a cutting, which is very easy to grow. Cuttings are left to dry for a few days to a week after removal so postage is no problem. This is the self pollinating variety (only one plant needed). In 9 months you should have your first fruit. If fruit doesn't set the local wildlife (moths, bats, etc) aren't pollinating your flowers and you will have to. Fruit are up to 1 kg, spine-free, with red skin and white flesh. The fruit is delicious to eat fresh or chilled, and is lovely with lemon or lime juice or with ice cream. Its dragon shape makes an attractive edible garnish. It is also used in jams or as a base for drinks. Flower buds can also be cooked as a vegetable. Place the bottom half in well draining material (a mix of sand and potting mix is fine) in a semi-shady spot. Water in well then water only after the soil has a chance to dry out. Needs full sun to part shade in a tropical/subtropical to temperate climate. Use a well-drained soil mix e.g. 2 parts sand, 1 part loam, 1 part peat moss. Is adapted to summer rainfall and a winter dry season. Grow up a trellis, fence or tree, making sure the plant can hang down in a weeping fashion as this encourages more flowers/fruit. Can grow as far south as Melbourne but protect from frost, and the further south you are the more sunlight the plant needs.